Elizabeth Warren has vowed to take on moneyed interests on Wall Street and in corporate boardrooms if she’s elected to the White House. It turns out she has Big Tech in her sights, too. In a recent essay published on Medium, the 2020 presidential candidate and Democratic senator from Massachusetts calls for breaking up Amazon, Facebook, and Google, all of which she describes as monopolies that undermine smaller business and stifle innovation. All three of those corporations are much better known for their work in the broader consumer space than they are in schools. But they each have a stake in the K-12 marketplace, though they occupy very different places in the world of schools and students. What might Warren’s campaign pitch mean for those companies’ work in schools? Getting a gauge on this question requires a ton of speculation. That’s partly because the regulatory regime Warren proposes offers no real details on what her plan might mean for the divisions of the tech giants that are focused on K-12 education. A core piece of Warren’s plan is a requirement that large tech platforms with annual global revenues of at least $25 billion would be designated “platform utilities” that would be barred from owning both the platform and any participant on the platform. They would be required to “meet a standard of fair, reasonable, and nondiscriminatory dealing” with users on the platform. Warren vows that her presidential administration would appoint regulators who would break up mergers that reduce competition. Warren says Facebook’s acquisition of Instagram, and Amazon’s acquisition of Whole Foods are examples of deals that should not have been allowed and need to be unwound. In addition, Warren, says platform utilities would be blocked from transferring or sharing data with third parties. That’s an idea that would seem relevant in the education community, where concerns over data privacy have swirled around Facebook, Google, and other ed-tech providers for years. Facebook endured a barrage of criticism last year following revelations that it allowed a political consulting firm, Cambridge Analytica, to use data collected through the social-media platform to create voter profiles in the run-up to the 2016 presidential election. Those revelations have led some districts to review their Facebook policies—though, as Education Week reported last year, K-12 systems did not abandon it in large numbers. Many districts rely on Facebook as an online communication hub to get information to parents and others in the community. Google was sued in federal court in 2014 for building hidden profiles of users on the platform that could be used for targeted advertising. That same year Google told Education Week it had “scanned and indexed” emails from millions of students using the platform, a practice which it has since stopped. None of the three companies responded to requests for comment. If a Warren presidency brought a stricter regulatory environment for Google and Facebook, it would most likely—albeit indirectly—compel K-12 leaders to re-examine their relationships with those companies’ products, said Hal Friedlander, the former chief information officer for the New York City schools. If the push for regulations brought public hearings and negative press about data privacy practices, for instance, “that would influence public opinion pretty dramatically, and that opinion would show up in the schools,” said Friedlander in an interview. He now leads the Technology for Education Consortium, an organization that seeks to bring more price transparency and quality to ed-tech products. It’s even more difficult to predict whether Warren’s proposal would compel a company like Google to shed any of its education-related business offerings, such as operating systems or classroom products. Breaking up big companies in the education spaces might be good for smaller companies trying to break into the market, and it might drive down prices for some products, said Friedlander. But in many cases, districts’ biggest challenge isn’t finding affordable products, but judging the quality of those tools and platforms, he said. 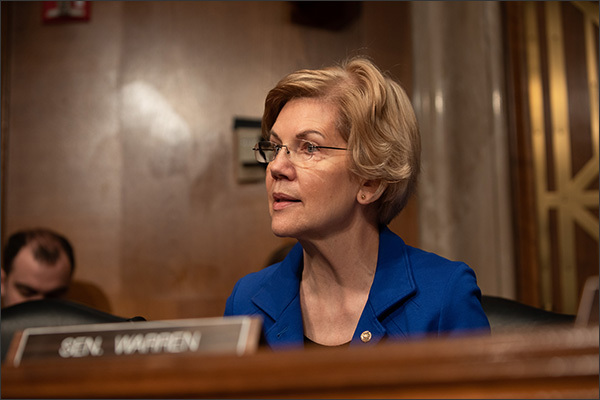 Warren’s proposal has drawn a hostile reaction from some conservatives and others scattered across the political spectrum, who question its feasibility or see it as a government overstep into the private sector. It also drew a skeptical response from fellow Democrat and White House hopeful Beto O’Rourke. “I’m not sure if having five more Facebooks—if you broke up Facebook into five component parts, or any of these other large social media or technology companies— makes as much sense as regulating them, given the power they have [and] the way in which they can be used, wittingly or not, to undermine our democracy and affect the outcomes of our elections,” O’Rourke said at an appearance in New Hampshire. The other mega-tech company Warren sees a ripe for more regulation is Amazon, which has a growing presence in K-12 business. Many school districts have come to rely on the online retailer for its cloud-based storage system, Amazon Web Services. And Amazon is playing an increasing role in K-12 purchasing, including through an arrangement with U.S. Communities, a cooperative purchasing program that districts tap into. Amazon has also sold a math curriculum, TenMarks, to K-12 schools, but the company announced it will end support for the program at the end of this academic year. The institute’s statement did not reference Amazon’s work in education, specifically. But in a report released last year, the organization questioned whether Amazon’s role in public-sector purchasing—including school district buys—is hurting local businesses, and resulting in districts overpaying. Photo of Elizabeth Warren at a recent congressional hearing by Eman Mohammed for Education Week. What Ms. Warren fails to recognize is that Amazon has thousands of small, independent businesses that use the Amazon site to sell their products. Rather than monopolize, Amazon broadens the customer base of these smaller businesses. Further, through the auspices of Amazon Smile, charities have a broader donor base. And if we’re talking tech; is there a reason Microsoft isn’t on the list? I was not familiar with these products until I read this article, but, now that I have seen them, I find them all a distraction from what might be created by teachers for their own individual classrooms, using connecting student iPads to a server that allows the teacher to use Apple TV projected on a screen to work together on an assignment and display individual work created by students on their iPads. This would be a proper use of Apple products—without Apple deciding what kind of lesson should be taught. Let technology support teachers creating lessons to share with colleagues, building a network for collaborative professional development to advance their profession as they engage their students in lessons they have created themselves. Today’s big tech companies have too much power – too much power over our economy, our society, and our democracy. They’ve bulldozed competition, used our private information for profit, and tilted the playing field against everyone else. And in the process, they have hurt small businesses and stifled innovation. hi, my name is Lokesh. I found this information important. Please click AOL Support Phone Number more information.